Rather like the pompous lecturer played by Peter Capaldi in Peep Show, this week I've been spending much of my spare time reading, so haven't had a huge amount of time for watching films. (I've also been working on Rhombus magazine, my little folly). What have I been reading, I hear you ask? Well, nothing too highbrow, I'm afraid - I finished off Stewart Lee's collection of his stand up routines, and have now moved on to The Snowman by Jo Nesbo. It's not bad - the prose isn't always particularly elegant (possibly because it's a translation into English from Norwegian), but the plot is very gripping, and 450 pages in, I'm still none the wiser as to who the killer is. Well, fascinating insights into my reading habits aside, let's move on to this week's reviews. To be honest, I saw this picture on Monday and have already largely forgotten it - I'm not sure if that says more about my decaying mental faculties, or the quality of the movie. Looks like I may have to quit sniffin' glue in the near future. 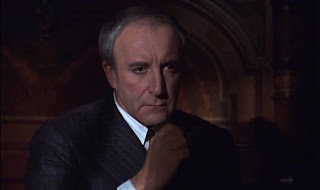 Anyway, this one stars Peter Sellers as Chance, a middle aged and slow witted gardener who has been working on the same country estate for most of his life. After his employer dies, he is left to fend for himself in a rough neighbourhood in Washington DC, but after being hit by the limousine of the wife of a wealthy businesssman (Shirley Maclaine), he becomes a friend of the family and is able to stay in their sprawling country home. Throughout the film, Chance's simple minded statements about gardening are taken as insightful and profound meditations on the state of the nation, and he rises to national prominence as an advisor to the president himself. I guess this is a comment on the way people judge others on the way that they look; Chance's impeccably tailored appearance makes him look like a wealthy and important person, so people around him view him on that basis. It seems a little implausible that Chance would be able to take in so many people, based merely on his appearance, but there you go. Despite the slightly implausible plot, from what I remember of it, this is a solid film, with good performances from Sellers, Maclaine and Melvyn Douglas. In which John Wayne stars as Ethan Edwards, a grizzled old cowboy, on the hunt for the Indians who have kidnapped his niece. He's joined on his quest by the girl's stepbrother, Martin Pawley (played by Jeffrey Hunter), who is himself part Cherokee. There are always high expectations when seeing a film which is regarded as a classic, and to be honest, for me, this film didn't really live up to them. I feel like a bit of a philistine in being so critical to a film which so many people have acclaimed, but as the film progressed, I was just looking forward to the end so that I could take the disc out of my DVD player, and send it back from whence it came (LOVEFiLM's big warehouse o' films). For me, one of the main problems was with the pacing of the film - the search went on, and on, and on, with little interesting incident en route. Some of the humour in the exchanges between Martin Pawley and his fiancee now seems very dated, as does the macho posturing of John Wayne's character. 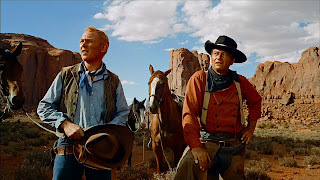 On the plus side, the cinematography is top notch, taking full advantage of the technicolour film with some gorgeous footage of Utah's Monument Valley. I wouldn't say watching this film was a total waste of time, but I don't see myself returning it in the future. My favourite film of the week and definitely the best Mexican cannibal movie I've seen this year. The film opens with the father of the family in great pain and distress, shuffling around an ultramodern shopping centre before collapsing on the floor and dying. At his autopsy, the pathologist makes a grisly discovery - contained within the man's stomach contents was an undigested human finger... We then get to meet the rest of the family - a mother and three teenaged children - whose life had previously been based around eating whoever Pop brought home to dinner. With their father now out of the picture, his progeny now need to fend for themselves, and they soon discover that it isn't going to be easy for them to find fresh prey. Despite the grisly subject matter, the film works as a satire of the failings of modern day Mexico - with incompetent and corrupt police and the marginalised and impoverished people on the edge of society (such as prostitutes and street children) easy prey for monstrous elements within Mexico City. Despite the family's horrific and deplorable actions, each member of the family is a recognisable and relatable character, and I found myself rooting for them to get away with it, even as the police drew ever close to them. From an acting point of view, I particularly enjoyed the performance of Paulina Gaitan (who I also liked in Sin Nombre) as the strong willed and sensible daughter. The film is also strong on the visual front - with a striking contrast shown between the cold, antiseptic environs of the upmarket shopping mall, and the filthy, squalid conditions in the poorer areas of town. For some reason, this movie has only been rated as a '5.7' on IMDB, but I'd rate it much more highly than that. This recent documentary from James Toback makes an interesting companion piece to the Bobby Fischer film which I saw last week. 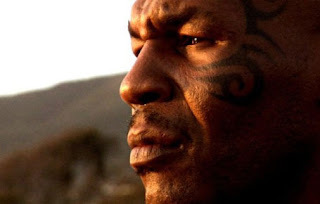 Like Fischer, Mike Tyson was a boy who grew up, neglected and (in Tyson's case) bullied, in a poor part of Brooklyn, was able to escape his humble origins by excelling in his chosen pursuit but was brought crashing down to Earth by his personal demons. The film tells Tyson's story entirely in his own words, though he isn't always the most articulate of storytellers, and of course this means that we only get one side of the story. Tyson's words are accompanied by footage of his career as a fighter, as we see him develop from a highly promising teenage Olympic champ, to the astonishingly brutal days of his 'Baddest Man on the Planet' era and through to his nadir as a washed up pug fighting second rate British heavyweights to pay off his extensive bills. Thankfully, unlike Bobby Fischer, it seems that Mike Tyson has been able to find some stability in his life now as a family man and pigeon fancier, so there is hope that his story will have a happier ending than that of the former World Chess Champion. Watching this film, I felt rather like I'd been subjected to a bait-and-switch manouevre by the film's promotr- from the title, I expected a sci-fi movie exploring the implications of parallel universes, but instead I got a low key indie drama about a young woman attempting to atone for a terrible mistake she made as a teenager. Which is fine, but y'know, if they'd decided to call the movie Atonement 'Intergalactic Space Warriors', I would have expected a rather different film than the one which I actually saw. To be fair, the film does include a background storyline in which a second planet Earth has been spotted orbiting our own planet - a world which acts as an exact double of Earth as we know it, complete with doppelgangers of every person on the planet. However, this concept is very much peripheral to the central plotline of the movie, which focusses on Rhoda (Brit Marling), who has recently been released from prison after serving a three year sentence for a drink driving incident that lead to the death of a Yale professor's wife and son. In an effort to make up for what she has done, she begins cleaning the man's house (though he is unaware of her true identity) and things start to get complicated as the pair develop romantic feelings for one another. Though a little on the slow side, the story is fairly well told, with a strong performance from Marling in the lead role. The film also gains plus points in my book for featuring the strange and eery sounds of the musical saw - it's the first time I've seen that instrument in a film since I watched Delicatessen. However, I felt like a potentially fascinating premise had been wasted, and I would rather have seen an exploration of the other Earth and its inhabitants. As such, I found the movie to be rather frustrating. This is one story of a boy flying high on his magical dragon that does not, as far as I'm aware, have any drug connotations. 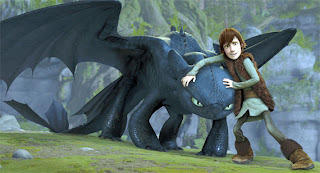 Set in a remote village where Vikings have been battling dragons for generations, our hero is Hiccup (Jay Baruchel), the teenage son of the clan's chief, Stoick the Vast. As a scrawny youngster without any aptitude for fighting, he is a disappointment to his father, but he comes to discover that his talents lie in another direction. He is able to befriend and train a fallen dragon, and comes to realise that it may be possible for Viking and dragon to live together in peace without the need for bloodshed... After a weekend of rather depressing films involving Mexican cannibals, Mike Tyson's troubled psyche and a broken woman expressing her remorse over causing the death of a family in a car crash, it was a welcome change of pace to watch something a little more innocent and wholesome. Although this movie is aimed at a younger audience, there's plenty in there for adults to enjoy. The animation, particularly during the battle sequences, is highly impressive, the script is frequently amusing and the voice cast all do decent work with their respective parts. As a minor negative point, the film seems a bit confused, geographically and linguistically - for some reason, the elder Vikings speak with Scottish accents, while the younger ones are American. Anyway, while I wouldn't put this one up there with Pixar's greatest hits, it's a very enjoyable ride. 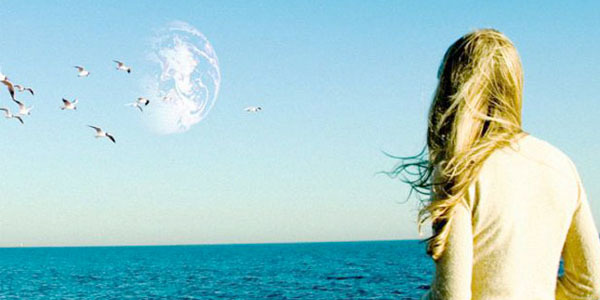 About the musical saw scene in 'Another Earth': have you seen the movie 'Dummy' with Adrien Brody? There is a musical saw scene there, too. In 'Dummy' you actually see the real saw player on the screen. It is the same lady who played the saw on the soundtrack of 'Another Earth', Natalia Paruz (SawLady.com ). I haven't seen that movie - I'll have to check it out. I do like the strange sounds of the musical saw, but as far as I can remember, the only film in which I've seen it feature is Delicatessen.